In the last year, Barclays have rebranded themselves. This is not just a change in the logo (as apparent with NatWest) but a focus on the customer experience. Go into a branch and there’s a calculator on the desk to add up those cheques you are paying in. And a pen to fill out your paying-in book. A free pen. 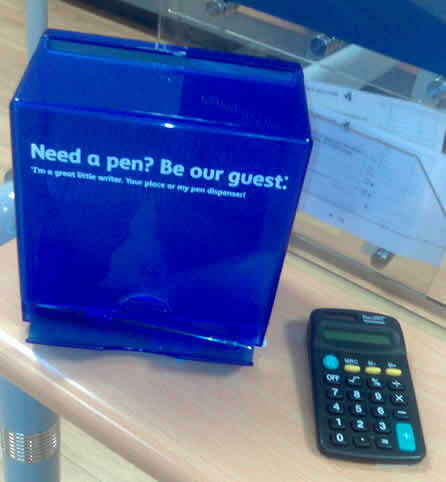 A nice touch – they don’t assume their customers to be thieves and chain the pen to the desk – how much does a pen cost? And put a logo on the pen and you have free advertising. 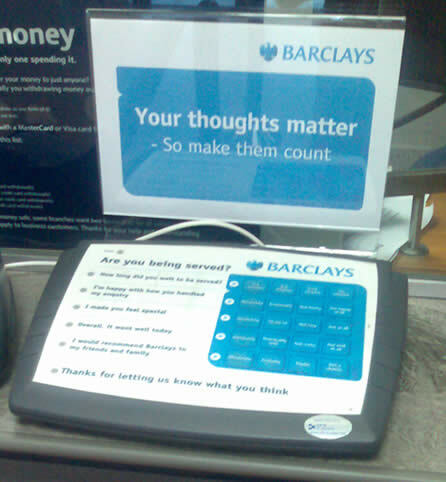 On the counter there’s some technology to enable customers to rate the experience they’ve just had. Capturing customer feedback at the time of engagement, better than a focus group at a later date in a stale market research suite. I think that we can borrow some of this thinking when we build software. I’ve written previously about emotional requirements – how do we want users to feel when using what we design and build. Before we start on something new, ask the question “how warm do we want our users to feel when using this product?” It’s a useful level to pull; warmth is probably going to cost more.” “If this product was a car, what car would it be?” If the customer says “Ferrari” and we are thinking Ford Mondeo we need to focus on managing expectations. A Ferrari is going to cost a lot more than the Ford. I’d like to know what I’m going to get before I start bragging about the new sports car I expect to soon be parked in my drive.